"Living U.S. Women's History: Voices from the Field, 1960-2000," is an oral history project directed by Kathryn Kish Sklar of the State University of New York, Binghamton and Mary Logan Rothschild of Arizona State University. With funding from the American Association of University Women, this project has compiled in-depth six-hour digitized video interviews with more than fifty historians of U.S. women. Interviews and related materials are being deposited in the Sophia Smith Collection of Smith College. The project documents the personal and professional perspectives of historians who, between 1970 and 2000, generated new knowledge about women in U.S. history. 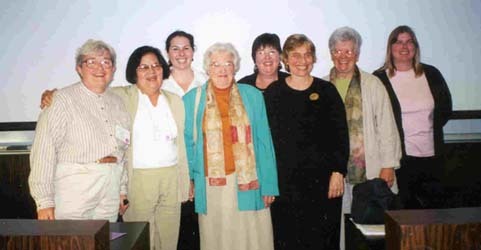 Scholars have been selected on the basis of their ability to illuminate the emergence of the field of U.S. women's history in the 1970s, including subcategories such as the history of African-American women and Native American women, and on the basis of their ability to demonstrate the flowering of the field's diversity after 1980, with the addition of such areas of study as the history of Mexican-American women, Asian-American women, lesbian women, the history of women's sexuality, and the representation of women's history in public history sites such as museums and national parks. In this way the project documents the unfolding of the field's potential as well as its early promise. analyse these oral histories in two books: one an edited volume with excerpts from the oral histories; one an interpretive study of what the oral histories tell us about the incorporation of gender in historical studies and (more generally) changes in American higher education in the closing decades of the twentieth century.